Hawkeye is one of the most underrated avengers. He can hit almost anything he shoots his arrows at, and he even dated the Black Widow. He is so awesome! These gauntlets are absolutely necessary for any archer. If you want to hit the smallest, fastest moving target, you need to protect your fingers. 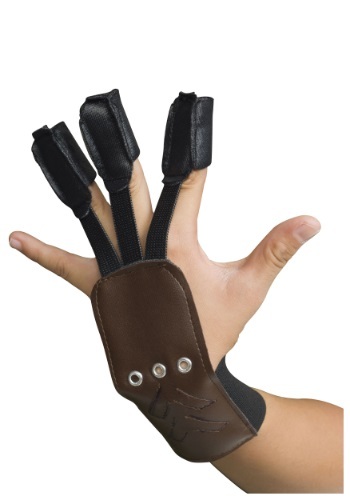 No hero should be without his signature weapon, so make sure that your Hawkeye costume is completed with these officially licensed Child Hawkeye Avengers 2 Gauntlets. Fighting Ultron is going to take all the trick arrows you've got, so don't forget to gear up your hands like a hero. These gloves come straight from Hawkeye's look from Avengers: Age of Ultron. These archer’s gloves have an elastic band for east on and off – crucial in any combat situation – and are made out of a durable synthetic leather, so they will last through any battle!